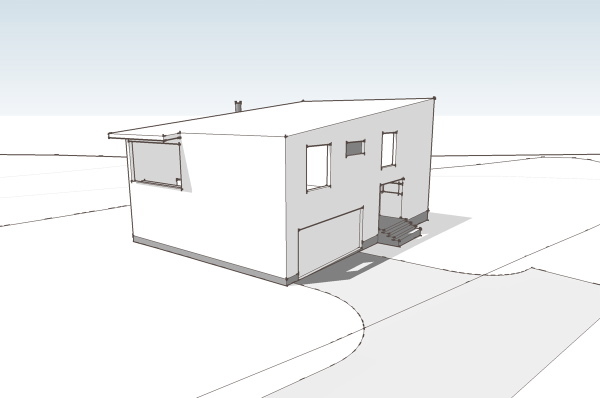 Continue reading "0857 L House - model takes shape"
The next design print in progress. 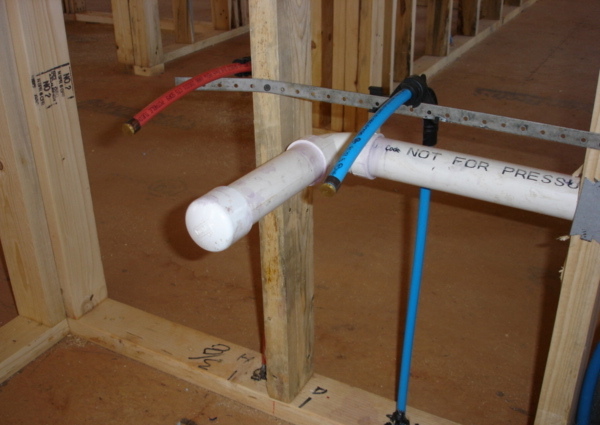 Continue reading "Guess the upcoming house plan"
A few new photos from the owner of the Virginia Plat House today. The siding is all done and the exterior more or less finished. The interior work is beginning now. Here is the master bedroom side of the house. I liked this photo because it gives you a good look at the side overhang rafters. They did a good job with this detail which is always gratifying to see. You can also catch a glimpse of the creek in the distance - what a great setting for this house. There are three new photos of the house posted at the flickr set for this project. Also remember to look at the LamiDesign Flickr photo pool to see all the photos from customers documenting the house designs under construction. Our thanks go out to them for sharing their projects with us. 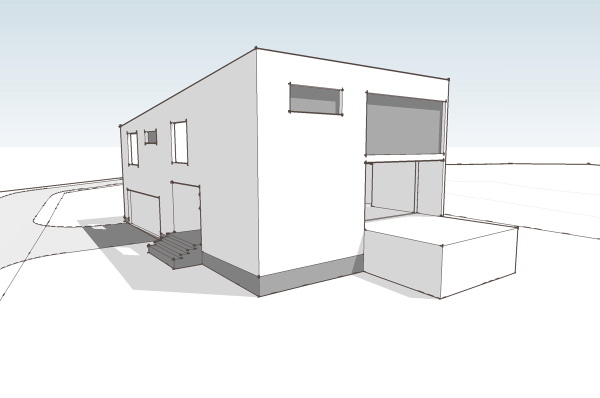 Continue reading "Virgina Plat House - exterior complete"
Today we will look at the next scheme from the suburban house project. This scheme came later in the process and so the sketches are more fully developed than the other schemes we have looked at. 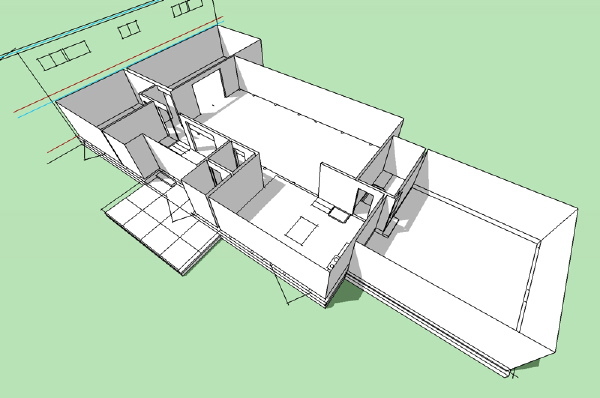 In this scheme we returned to the idea of the gathering of spaces around the living room, with the secondary spaces seeking a physical connection back to the center of the house. 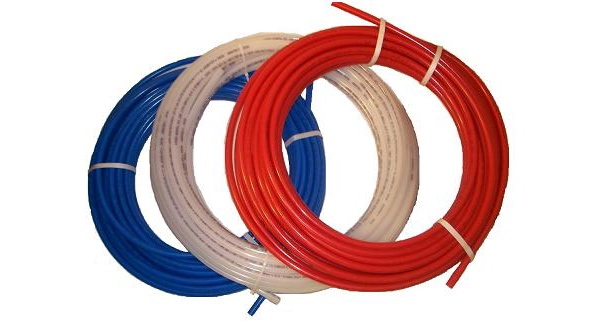 We also struggled to find a way to make a positive solution to the need to elevate the plumbing in the house above the septic system without lifting the entire house out of the ground and compromising the connection to the landscape or bringing in large amounts of fill. 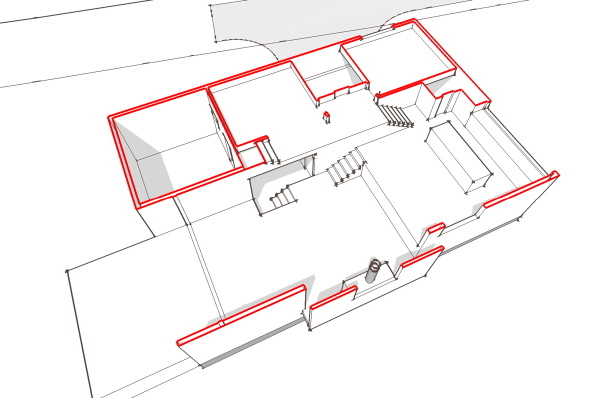 What we arrived at was a rather complex interior space arrangement which followed a multi level path through the house, but existed within a simple massing under a simple roof. 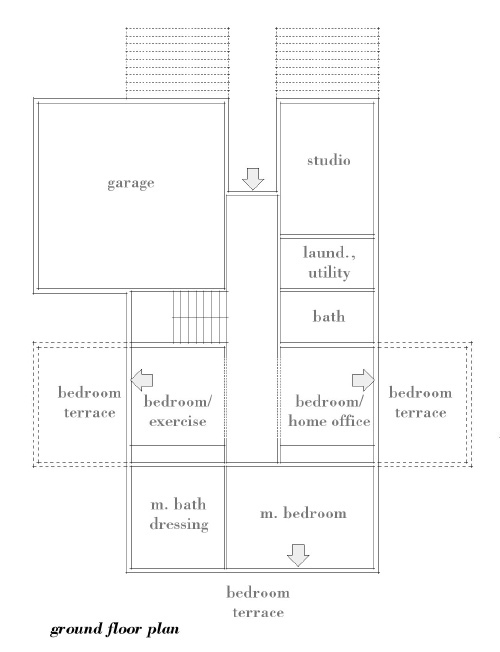 I think the house is difficult to understand from floor plans, yet we'll look at them anyway. Those of you who can read plans well will enjoy the jump from flat-land to seeing the space in your mind. For everybody else we'll look at some better representation further down. click below to continue reading.. So on the ground floor you arrive at the house at what is a very ordinary suburban situation - a garage door flanked by a recessed entry. This gives way to a small vestibule which is also joined by the entry from the garage. Adjacent to the entry is a nice sized home office/studio space. 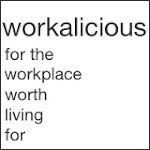 This is great for home office workers as it is removed from the rest of the house and is even workable for taking meetings without parading through the home. From the entry you proceed up a third of a level to the living room - a small stair. You arrive in the living room space, a high story and a half space. 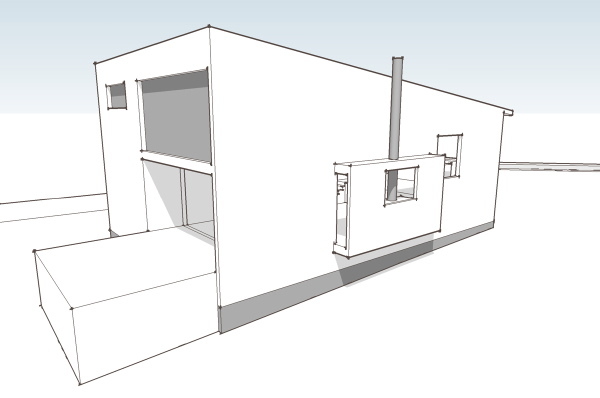 Straight ahead is a fireplace with niche on either side (actually not drawn on plan), to the left is the kitchen and dining area, which is another level up, and to your right is a more intimate area with a lower ceiling that has a window wall facing out to the site. Take the short steps up to the kitchen and you have a large table area that overlooks the living room. The kitchen has a large island, and another counter at the wall. Above the countertop is a large window looking out at the front of the house. At one side is a pantry space and another short stair that brings you up to the bedroom level. The bedroom level has short hall/balcony that overlooks the living room. 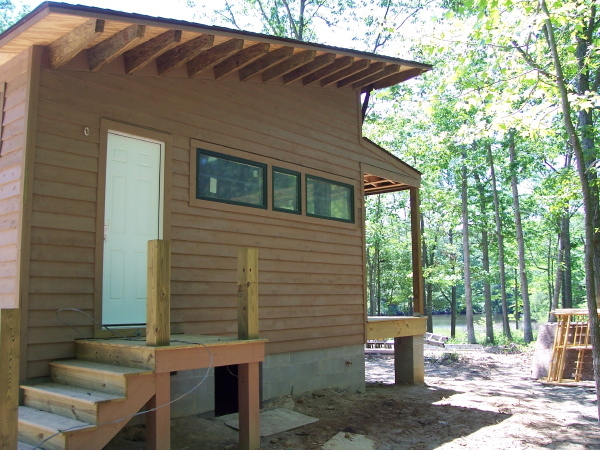 The two bedrooms share a bath room and have windows overlooking the side of the house where the entry door is located. At the end of the hall is yet another small stair that takes us up to the master bedroom level. The master bedroom bridges back over the living room on the left, and to the right has a large area for closets and master bathroom. Unlike the other bedrooms it is very isolated and feels removed from the rest of the house. This section view above gives you a pretty good idea of all these level changes, but this cut away view is probably even better for understanding the layering. 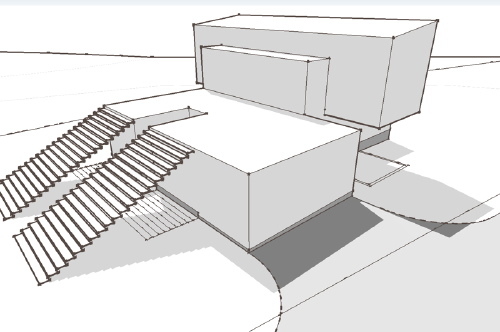 And here is a rough walk through of the sketch model which will give you the best representation of the space and how the parts relate to one another. 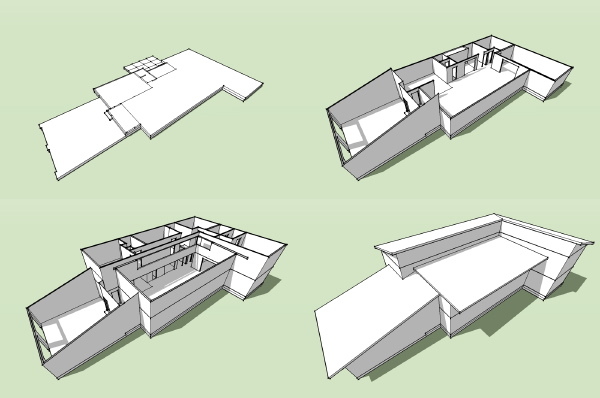 I liked this solution as its simple geometry was efficient and economical yet it provided a very dynamic interior space that served the program. Right now its my favorite candidate for conversion into a stock plan. 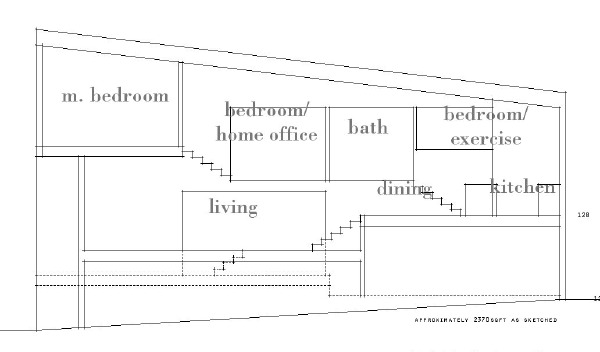 Continue reading "0751 Suburban House - fourth scheme"
This is tangental to my blog, no doubt, but the state of the housing industry is relevant to our interest in the resurgence of modernism as a housing product. If you have money to build or are able to borrow in this credit climate, its actually a good time to build. And that's an opportunity for modernist to get a foot in the door, for developers flat out of luck its a market that still has demand. So read up, or listen up as the case may be, and learn what actually went down in the credit bust. This radio program "This American Life" just did a review of the recent history of the ongoing credit crisis, and the housing crisis it spawned, and the overall stinky economy following on its heels. This is the best plain language, easily understandable account of what has transpired that I have heard to date. It was put together by a pair of reporters, one a financial correspondent for NPR, and the other a regular from This American Life. So it puts together accurate financial reporting with a human outlook and good story telling. If you think "yeah, I know there is a credit crisis but I don't really know what just happened" then this is a worthwhile listen. It puts it in very human terms as well - via the experience of a lot of people who participated in it. I'd really love to blame somebody. Sure there was greed in there, but not nearly as much greed as sheer stupidity. You know, its like those C students I went to high school with, the ones that were not nearly as smart or responsible as me, but today make so much more money than I ever did or ever will. Its like these are the ones we leave our economy to. And they'll put it into a tree on a joy ride as readily as they did with their dad's Old's Cutlass back in high school. http://www.thislife.org/Radio_Episode.aspx?episode=355 These podcasts are only available as a free download for a week, starting this past sunday. So get it now or pay later. 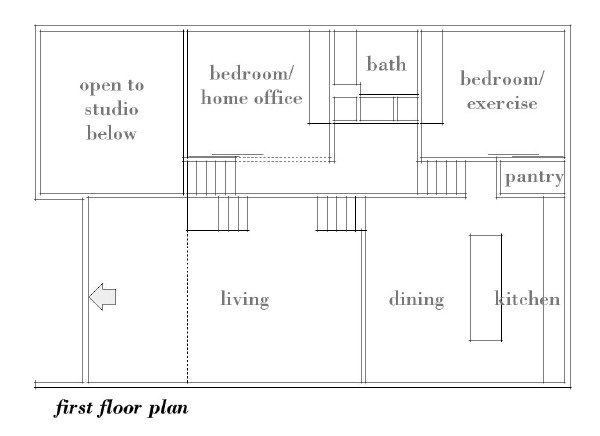 Continue reading "A coherent account of the Housing Boom/Bust"
Time to look at another schematic scheme from the suburban house project. 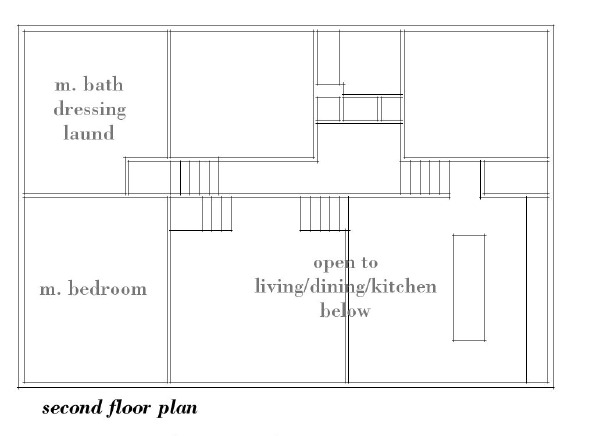 This scheme was centered around an interesting idea about how to organize the house, but also departed from the previous schemes because of this. Here the living+dining+kitchen space is imagined as a glazed rectangular volume set atop a plinth containing the rest of the functions of the house. 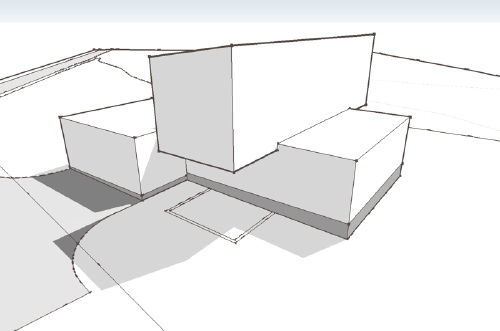 This may be a little bit harder to imagine because the schematic model really does not give a good representation of how this would be integrated into the landscape. 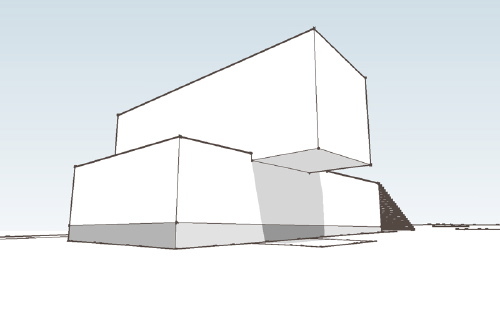 The plinth would be masonry, sunk into the earth, the stairs at the front looking like a bit of a ruin, emerging out of the landscape (which with fill needed for the site would not be as long as shown in the illustrations). The bar atop is lighter, framed, with many windows, cantilevering off the base on both sides. Click the link below to continue reading. When you approach the house there are two ways to enter. If you go up these steps at the front of the house you then walk across pavers on a green roof to a "front" door in the living dining kitchen bar. There is a smaller volume extending towards the front of the house here which is relatively solid, and beyond it the volume of the bar is more transparent. You enter through the door and step into the broad view through the bar into the landscape beyond. Another green roof and roof terrace mediates between the room and the landscape. The second way to approach is to descend into the grotto that exists between the pair of front steps which will take you to an entry door. This door brings you into a center hall at the lower level of the house. 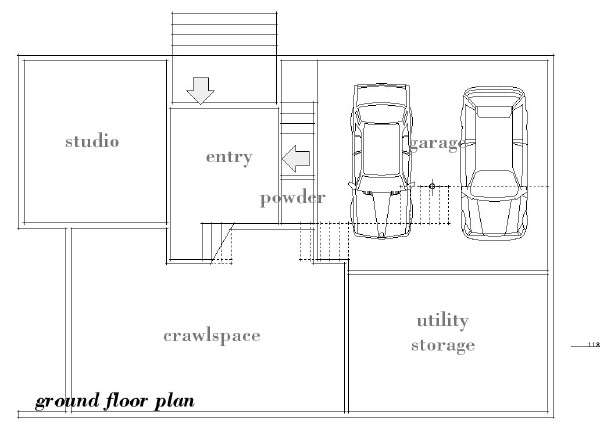 The home office and studio is to one side, and the entry to the house from the garage is at the other. 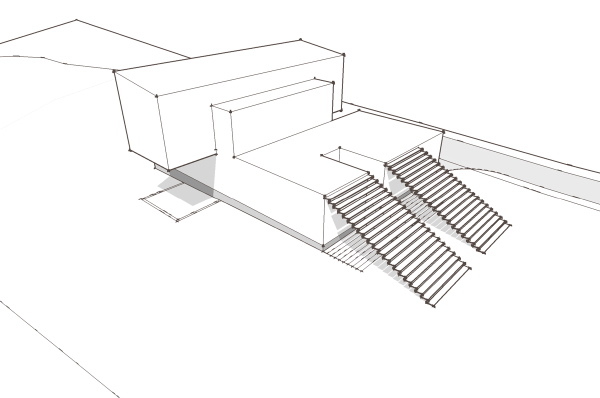 Beyond is a stair with light descending from above, and further the two secondary bedrooms. Each of these rooms is at grade and has a small patio, its own private outdoor space sheltered by the bar above. At the end of the hall is the master bedroom suite which also has its own patio at grade extending off the end of the house. 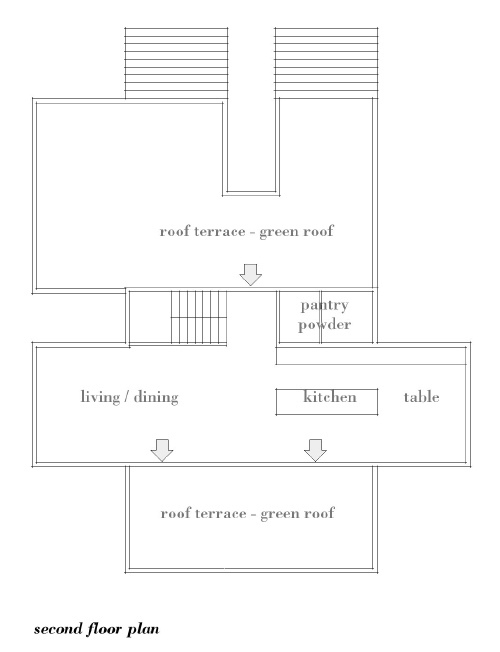 I've tried to describe the house more as an experience, since this rough model does so little to describe the definitive characteristics of the house. This proposal did not meet the brief for the project in many ways, but it still remains an intriguing idea for me. Perhaps it will find its place as a house plan in the future. Continue reading "0751 Suburban House - third scheme"
0357T - Timber Case House, Construction Prints Done! This plan set has been kicking around on the back-burner for a few years now. I had created the Design Prints and started on the Construction Prints, but set it aside to develop other designs. 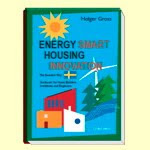 Its nice to have four variations on the Steel Case House, but getting other designs published took priority. But I'm in spring cleaning mode now and it was time to finish this and get it online. The Timber Case House differs from the rest of the Steel Case line in that it substitutes an engineered timber frame for the steel frame that gives the line its name. 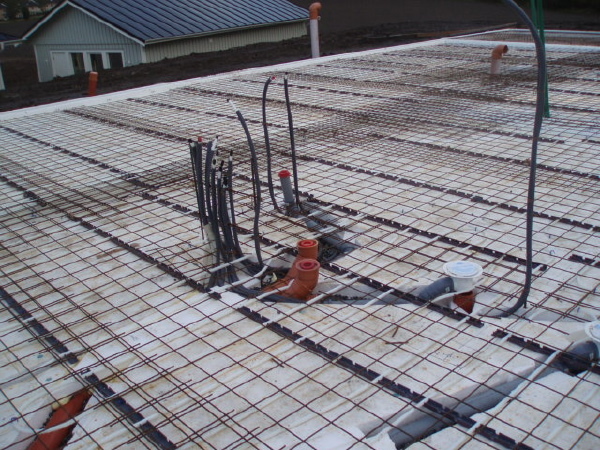 The SIPs entry wall and roof increase the performance of the building envelope making up for the vast glazed area on the back side of the house. If you have not studied this design in while now is a good time to take a second look. 0357T Timber Case House A few more plans sets to go and the initial collection will be complete. 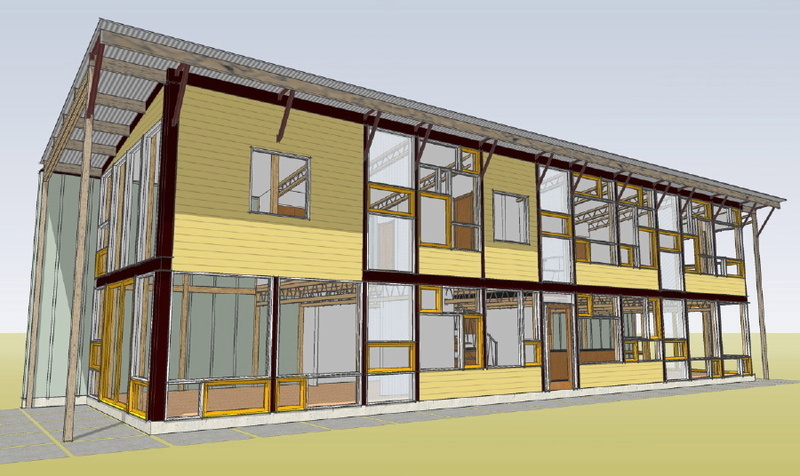 Continue reading "0357T - Timber Case House, Construction Prints Done!" 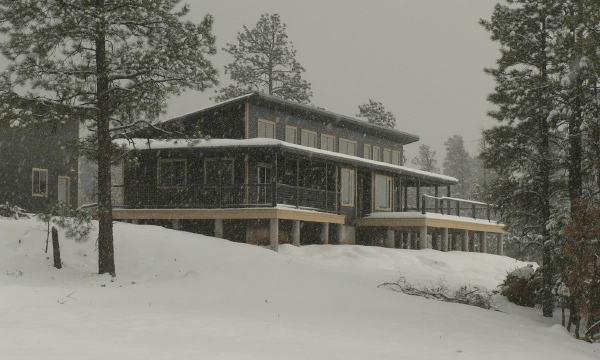 Continue reading "Letters from Sweden - plumbing the prefab"
We have not seen any photos of the Colorado Plat House since last August, so you can imagine my surprise to see a bunch of photos of the finished house in my inbox this week. I was blown away - what an amazing setting! There may be a few loose ends that we can't see, and there are no furnishing yet, but all the same its an amazing sight. Have a look below. continue for more photos by clicking the link below. 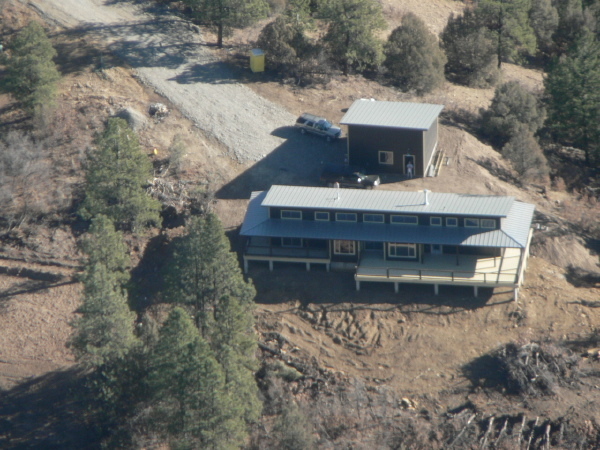 In the photo below, which appears to be shot from a plane or helicopter, you can see the wrap around porch roof which is a unique feature of this build. The owners have really had some fun finishing the interior - its like no other Plat House we've seen before. There is a corrugated metal ceiling and what appears to be cork floors. Look through the photo browser below to see some interior photos. Continue reading "Colorado Plat House - house complete"